Hello! My colors are navy blue (to match my fiancé’s air force dress blues) silver, and white, and I absolutely cannot come up with a good wedding centerpiece. I have no idea how to mix the colors or what should be where. (I'm not very creative) I know I'd like it to incorporate water and floating tea lights, but past that, I'm stumped! There are endless possibilities with the wedding colors you want to combine for your reception centerpieces, but my suggestion in creating your look is to keep it very simple and elegant. If you want to go the route of floating candles, which is a great idea and will allow your guests to see each other while eating, then a low floating glass vase would be beautiful choice. You can place the vase on a mirror which will help create the illusion of a bigger wedding centerpiece with the help of the reflection. Place either Navy Blue or Silver stones in the bottom of the vase and float Navy blue and/or silver candles in the vase to bring in your combination. You can vary the size of the candles or keep them unified or even add some simple floating flower heads to break up the candles - what ever you like the best. To make things even more interesting, you can alternate tables with the different color schematic to break things up a bit as well. For example, on one table have blue stones with silver floating candles and on the next, silver stones with blue floating candles, etc. Place white rose petals in and around the centerpiece and maybe even some tiny silver pebbles or stones to help bring out the silver in your combination. Lastly, don't forget to add at least 4 or 5 votive candles around the main centerpiece to add a needed romantic ambiance to finish off the look. Good luck and enjoy every minute! Is it ok to let our guests take home the wedding centerpieces at the end of the night? Yes, it is a nice gesture to let your guests take home the centerpieces at the end of your wedding reception. Spread the word that it is OK for them to take them if you don't want to be left with them at the end of the night. The only time that it is not alright is if any part of the centerpieces is rented, like a special container. Other than that, go for it! I’m having trouble thinking up ideas as wedding centerpieces for my tables. I was thinking of having a bottle of champagne on every table (8 tables) and thought I could use this in maybe thinking up of ideas around this but I feel a little at a dead end. What do you think? Having a Champagne Bottle as a centerpiece for your wedding event is a wonderful and great celebratory idea! The great thing about this idea is that you can choose to go quite simple or go fun & big. A simple idea would be to wrap a flower arrangement around the neck and body of the bottle, add some votive candles to the table and you have a simple, elegant centerpiece. Or, you could have a few long stem flowers coming out of the top of the bottles (see photo above for an example). You could take it a step bigger and add a ring of flowers around the base of the bottle, again utilizing votive candles & sprinkle the table with some light-catching crystals and you have a gorgeous centerpiece. To go even bigger you could make an entire Champagne basket, including chocolates and flowers or whatever your heart desires and watch your guests fight over who gets to take the goodies home with them! I am not very confident in using votive candles for my wedding reception because I am not sure how long the candles will last! The reception is from 6:30pm to 12pm. What would be the safe route to take in using the appropriate candles or should I just stick with using the votive candles? I really do want to use the votive candles which are so pretty to me but I don't want them to go out before the reception is over! I love candle centerpieces at wedding events because they add so much romance and ambience to a space. With that said, the rule of thumb is that a candle lasts as long as it’s width. 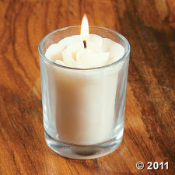 So a votive candle is generally only 2” Wide, which means that the candle will burn well for at least 2 hours. After this, the candles will burn down rather quickly. An idea is to have your wedding planner or wedding reception staff replace the candles as they burn down at each table. Without a wedding planner this can be very time consuming. If votives are your only wedding centerpiece on the tables at your reception, I suggest that you add a simple charger/plate with few different pillar candles; candles that are different both in length and width. These generally last many hours and you can buy them online at wholesale cost depending on how many you need or at your local craft stores in bulk. I would suggest at lest three different sizes per table and please still add a few votives, at least four, around the centerpiece of candles to make the table even more beautiful. Enjoy the day and I have a feeling it will be just breathtaking.